A.P.C. Women's Jeans Review: Is Their Denim Worth $220? A.P.C. Women’s Jeans Review: Is Their Denim Worth $220? That’s Jean Touitou’s, the founder of A.P.C., compelling analogy of A.P.C.’s signature piece: their jeans. Since 1987, A.P.C. knows what works: timeless basics. On any given French person in the 3ème arrondissement, it’s all A.P.C., all the time… actually on any French person in any arrondissement, it’s all A.P.C., all the time. After a fateful wander on rue Vielle du Temple in 2008, I’ve been an A.P.C. addict. A.P.C. jeans seemed too complicated. When do I wash them? How do they fit? Will they stretch? I couldn’t grasp why jeans had to seem slightly confusing, so I avoided them. … until I got my A.P.C. raw denim mini skirt… that skirt became my gateway to A.P.C. jeans. 10 years into my A.P.C. abundant life and it was time to invest in their cornerstone product. Jean Touitou started A.P.C. because of his personal desire for raw denim. Since his very first roll of Japanese raw denim, that was used for the very first sample pair, all A.P.C. denim has been sourced from Japan. A.P.C. raw denim became the denim for the Brooklyn/3ème arrondissement cool kids. … but A.P.C. doesn’t only sell raw denim jeans. They also offer pairs in treated denim, ie. the kind of denim that is most widely worn and sold. Raw denim is 100% cotton, it has a sheen to it and is the deepest indigo blue because it’s untreated. It starts off super stiff, but loosens over time. If you get a pair of A.P.C. raw denim jeans, they should fit super tight… like a you-can-barely-get-the-buttons-done-up kinda tight. Like a you-won’t-be-bending-your-knees-for-a-week kinda tight. Raw denim is better if you don’t wash it for at least three months. If you wash raw denim too soon, the fibres break down and the effect won’t be the same. When you do finally succumb and wash, follow A.P.C.’s signature washing recipes. A.P.C.’s raw denim jeans are unisex. They do not make models specifically for women. 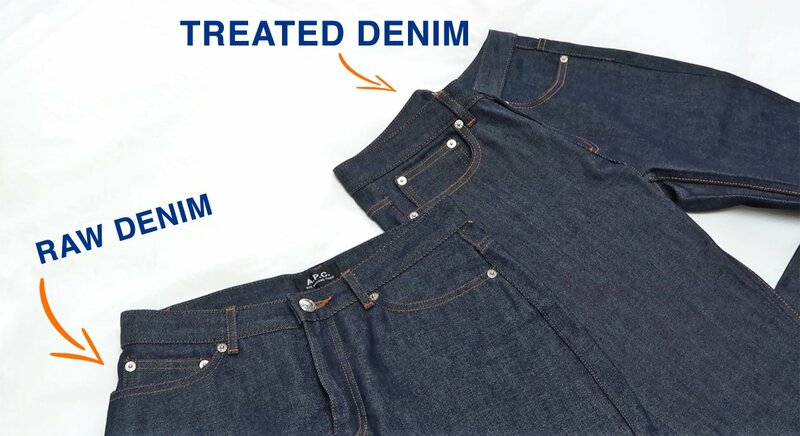 This is due to the whole “moulding to your body” effect that raw denim has, i.e. there’s no need for a specific model for women or men. If you give them the time (and hold off washing), these jeans will eventually feel like home for the rest of their life. Treated denim is the denim that we all know and love. It’s 98% cotton and 2% polyurethane, so it has some stretch… but A.P.C.’s version is still slightly stiff at first. A.P.C.’s treated denim comes in 3 different washes, including an indigo that looks like a raw denim dupe (see above photo). You should take your regular size in these jeans. Don’t size up or down, they won’t loosen and they won’t shrink. A.P.C.’s treated denim is available in models specifically for women or men. HOW DID I CHOOSE WHICH PAIR TO BUY? When considering what kind of denim (raw vs. treated) to buy, think about how often you’ll wear them. Raw denim takes a long time of daily wear to take shape. Can you commit to that? For me, A.P.C.’s unisex raw denim jeans would take too long. I wanted my legs to look longer with a pair of high waisted jeans and I wanted to wear them now. A.P.C.’s High Standard jeans are exactly that. They’re treated denim, so they’re all ready (relatively) soft and they have a high waist. They have a light shine (which will fade over time) and a deep indigo colour. Every box was checked! For my A.P.C. High Standard jeans, I took a size 26 (remember, these are not raw denim). I’m a size 24 in Rag & Bone jeans and a size 25 in Re/Done jeans and Reformation’s jeans. I’m also 5’5.75” and weigh 115-117lbs in these photos. My Rag & Bone jean size varies, but is normally a size 25. In clothing bottoms I normally take an FR 38 (my raw denim A.P.C. mini skirt is a 36 though) or a UK 10. I won’t have to hem these jeans because they fall at my ankles and don’t bunch up too much. For these A.P.C. jeans, I have to wiggle a bit to get into the size 26. While they have 2% stretch, it isn’t like the 2% stretch in Rag & Bone jeans. Once they’re (finally) on, they look like an art school student’s dream. A.P.C.’s denim quality is second to none. … but considering I haven’t had them forever, anything I say is simply speculation. So, take it from my friend Luxe, whose blog is second to none, when she emphasizes that A.P.C. jeans are an investment… seriously, her raw denim A.P.C. jeans are the only jeans she has worn since 2009. A.P.C. jeans have this subtle in the know vibe. Think Brooklyn art school student… like you’re a senior at Pratt about to graduate and get a job at an in the know gallery in Red Hook. Simplicity rules when it comes to these jeans. With a simple white t-shirt or a black tank top, your A.P.C. jeans take centre stage. –No Branding: Apart from a subtle logo embossed on the waist button, there are no logos on these jeans. They’re subtle and no one will be able to know, unless they know. –Wash: It’s like the deepest blue indigo you’ve ever seen. You just wanna drown in it… wait, is that morbid? –Caramel Stitching: The orange stitching complements the deep blue and makes the jeans pop. –Classic Cut: High waisted with a skinnier cut ankle? Not going anywhere for a long time. These aren’t your trendy pre-torn jeans. –Inconsistent Sizing: Not necessarily a con, but A.P.C. sizes differ from model to model. Try the jeans on at an A.P.C. store to make sure you get your right size, or find an online retailer with free returns/exchanges. While Mick Jagger couldn’t get no satisfaction, A.P.C.’s denim satisfies the most discerning denim wearer. No matter the material, no matter the cut, and no matter where you’re ridin’ round the world, A.P.C. makes above satisfying jeans. Available from a wide variety of stockists starting from $220 USD, but you can also shop on A.P.C.’s online store. –Visit an A.P.C. store to get your jeans: I love shopping online and I’m obsessive about finding 15% off coupons online… however, I knew I’d need a lot of help finding my A.P.C. jeans size. I bought them at their store in San Francisco. The sales associates could not have been more helpful. 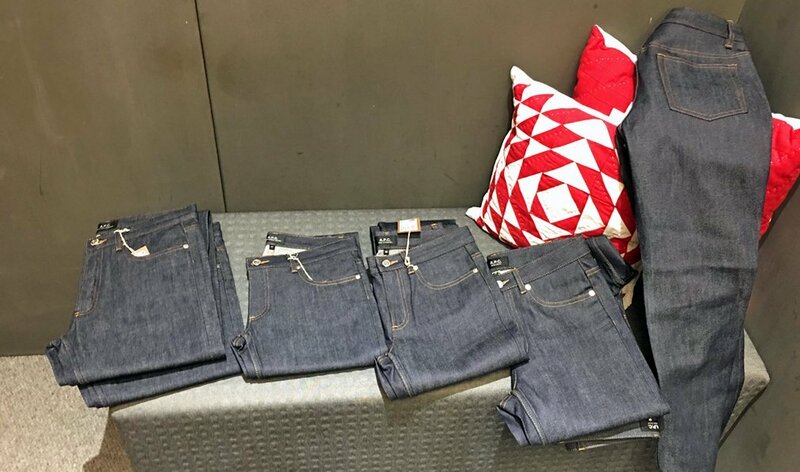 They took out 4 models in 2 sizes (so we’re talking 8 pairs of jeans) and let me take my time asking questions and trying them all on.